the juice of lemon 0.5 PC. beat egg with sugar, putting the container in which beat on the pan with hot water ( dishes should not touch the water) to increase in volume 3-4 times within 5 min. Remove the egg mixture from the water bath and add the mixture of flour with baking powder, stir gently until smooth. Line the bottom of 20cm baking lay a paper for baking, brush with butter (sides of shape not to grease), pour the batter. What would the biscuit during baking was smooth, twist several times the form with the dough clockwise. Bake at 180 degrees for 20 minutes to Cool, turn the cake on the grill. The sides of the form for baking lay a baking paper on the bottom to put the cake. Gelatin pour 40ml cold water, give to swell, then dissolve in a water bath. Beat the yolks with 0.5 cups of sugar. Take the yolks bright yellow. Whip the cream with the remaining sugar at the end, add a thin stream of gelatin. Connect whipped cream with yolk mass, stir gently and pour on sponge cake. Put in refrigerator for 1 hour to harden. Prepare gelatin as in the previous case. Whip cream. Chilled whites whipped with sugar and lemon juice until stable peaks, add at the end a thin stream of gelatin. Mix gently with a spoon the protein mass with butter. Pour on yellow souffle and put back in fridge for final curing for 2-3 hours. To release the cake from the mold, remove the parchment paper from the sides. On the sides decorate with wafer rolls. 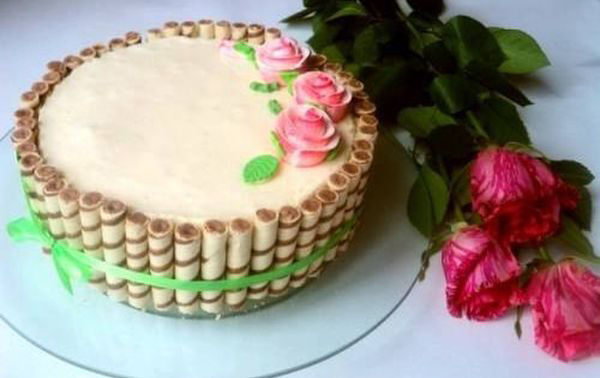 Top can be decorated with sugar roses.